At some point in your career, you’ve probably joined a project in progress or wondered why your successor or former colleagues made particular decisions. Understanding those choices can provide crucial context about how best to do your job and continue what they started. 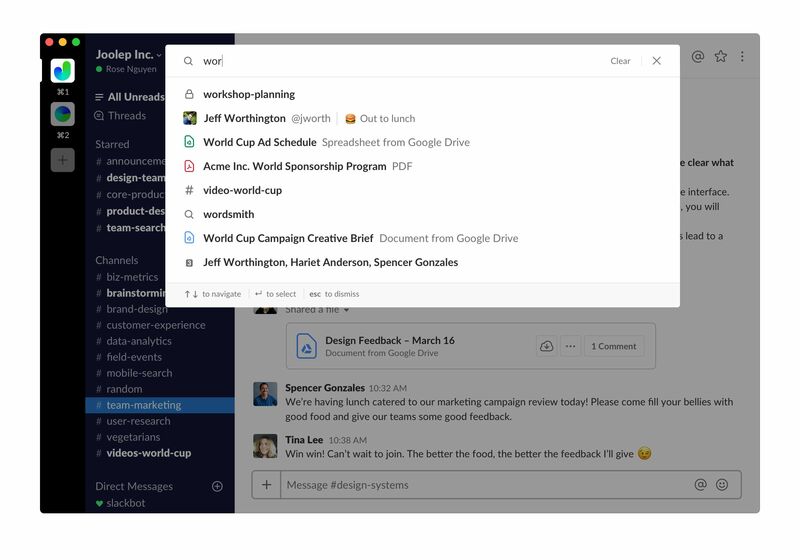 With Slack, it’s simple to find the right information, presented in context, by searching, reading, and referencing old conversations, project plans, and meeting notes. Slack stores that history in an easily searchable archive, making it painless to refer to everything from early brainstorming notes to finalized roadmaps. And because it’s all stored in Slack, there’s no need to ask your colleagues or the IT department for help unearthing important files from some long-forgotten shared drive or maxed-out inbox. Best of all, every member of a Slack channel can share meeting notes, project plans, and client files for immediate use as well as later reference. No more worrying about whether or not you were on vacation during a planning session or cc’d on every applicable email. When your team shares valuable information in Slack, it stays right where you need it, no matter when you need it. Slack channels have the power to transform how you work. Grouping team members by channels helps everyone connect with colleagues and organize information easily. And by using a thoughtful, consistent convention for naming channels, every team member knows exactly where to start looking for the answers they need. It can be helpful to think about prefixes as a logical extension of your existing naming conventions. For notes on working with external clients, you might begin channel names with #client- and build from there. Working on a cross-functional project, like a redesign of your homepage? Consider something straightforward, like #proj-homepagev2, and make that the home for all relevant notes, mockups, and feedback. 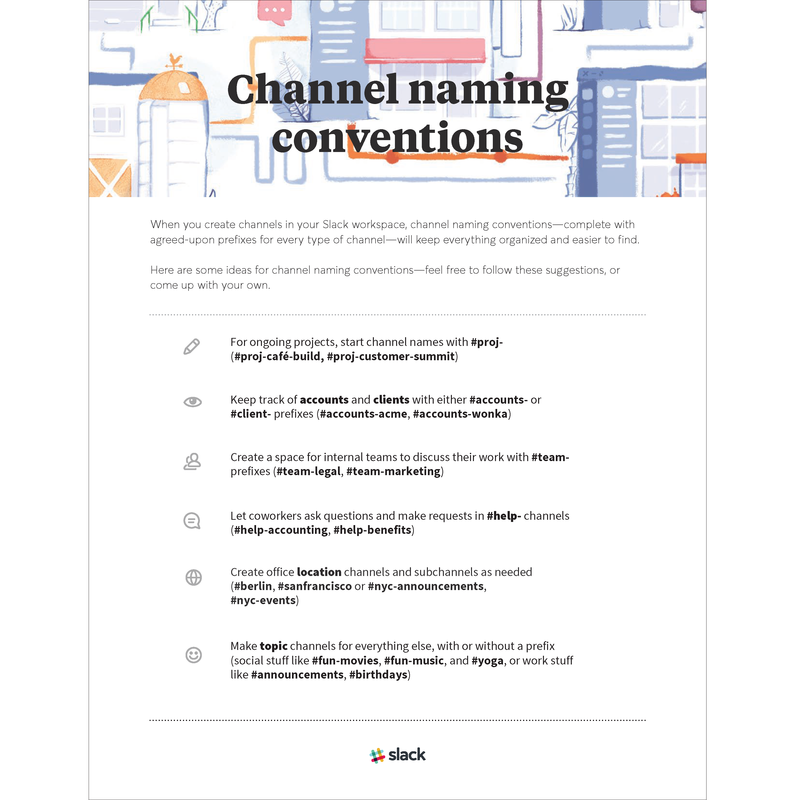 Naming channels in a consistent manner can be especially useful for larger teams, which simply produce more conversations and content across more channels. Want to make sure you can always locate need-to-know info? Try pinning Slack messages, files, and documents in your Slack channels and direct messages, so it’s both quick to reference and locate context around a key milestone. Pinning is a great way to make important reminders and top priorities visible for all channel or DM members. That includes new team members, who can use pins as a hassle-free way to refer to essential project details and deadlines. Everything shared in a public Slack channel is included in search results (the same goes for any private channels that you’re a part of). That means even when your team shares documents through integrations with other services such as Dropbox or Google Drive, every relevant PDF and text file will show up. Using Slack’s filters to quickly locate the information you need, you’ll ultimately enjoy doing a lot less searching and a lot more actual work. When you search for files archived in Slack, you also find the context surrounding them. Nothing stands alone in Slack, and that’s the beauty of it. For example, if you’re trying to understand any features of your company’s website, you might look in a project-specific channel for the scrum used by your firm’s software developers. Along with that blueprint for building the site, you’ll find conversations that log what every programmer was thinking. And just like that, you’ll gain insight into the reasoning behind a particular project, which can inform your work too. With a quick search or scroll through Slack, you can find the answers you need to make the best, most effective decisions about your job. That way, rather than retracing your team’s steps for scattered context, you can spend more of your time moving projects forward. Slack is the collaboration hub for work. When all your work happens in one place, you can find what you need to get work done faster.